And just like that, we have a baby that is 1/2 a year old! Oh my goodness, time is flying by way too fast and I'm afraid I'll miss too much!!! Baby K is changing and growing and learning so much, its amazing to watch her develop new skills. I feel like a lot has happened this past month, so bear with me as I type it all out! Stats: 15 pounds, 9.4 ounces (37th percentile). 25 inches long (13th percentile, still short - sorry Baby K). 17 inches head circumference (74th percentile, that huge head keeps growing). Development: Baby K can sit up! This is one of her big accomplishments as she can sit up for awhile unassisted. She will sometimes still fall back or to the side, but for the most part she has the whole sitting up thing on lock down. She is a pretty good roller, although she hates to be on her belly (not much tummy time for this kid). If we put her on her belly, she will cry for a bit and then roll right onto her back, immediately making her happy. She will sometimes lean over and grab her feet while sitting up, it is the cutest thing. We've also been experimenting with lots of different foods and she loves to eat! We bought her a high chair (thanks G Ma and Pa Pa) and she has a ball while eating. A tooth is trying to make its first appearance, we can feel the ridges on her gums, but nothing has popped through yet. Loves: She still loves to talk; especially when we are in the car or if she is playing with toys. She really likes rattles and toys that make music. And just like all kids out there (it seems), she loves our iphones. If she is upset, I can turn on one of the baby apps that I have and Baby K will perk up immediately. Since she is teething, she loves putting everything in her mouth. Nothing stands a chance against the drool machine! She recently started laughing when we kiss her on her belly; I love to do this at night before I put her to bed. Her giggle is seriously the best! My girl loves her cousin too! We spent Christmas with my parents, my sister and her family and my nephew and Baby K were instant companions. We have a photo of my nephew on a table in our living room and Baby K smiles and giggles at it whenever she sees his picture. Dislikes: Sitting still! I think we have a preview of how our child will be when she gets older, but this girl does not like to sit still. She constantly wants to be moving, playing with something or kicking. Sleeping: Her naps have really improved recently. She sleeps GREAT for Miss Gina (the lady who keeps her while we are at work), but she doesn't always nap so great on the weekends for us. But lately, its like someone flipped a switch and she decided that an hour nap (or more!) each time we lay her down was what she wanted. In fact, yesterday her first nap was a little over an hour and a half. I was floored and even commented that I guess she made a New Year's resolution to nap better. She naps three times a day and doesn't really put up a fuss when we lay her down. And she is still a rockstar sleeper at night. However, her lengthy sleep has caused her to lose some of her hair on the back of her head. But I don't care, I will take a bald baby who sleeps any day! Diapers: We switched to size 2 Pampers Swaddlers and Baby Dry diapers and haven't had any problems or blow outs yet. Although now that I typed that, I'm sure I'll be cleaning up one tomorrow! Eating: As I said above, we are giving her all sorts of different foods. She loves carrots and bananas (a recent discovery), but also really likes green beans, peas, squash and sweet potatoes. Surprisingly she is NOT a fan of apples. Tolar was feeding her one night and she kept pouting as he tried to get her to eat apples, so he switched to carrots and couldn't seem to feed her fast enough! She also loves rice cereal, we plan to start giving her rice cereal for breakfast each morning. Right now, she only gets pureed food for one meal a day, but her pediatrician said that we can go ahead and start increasing her food intake since she loves it so much. She still gets breast milk bottles too and continues to eat like a champ! 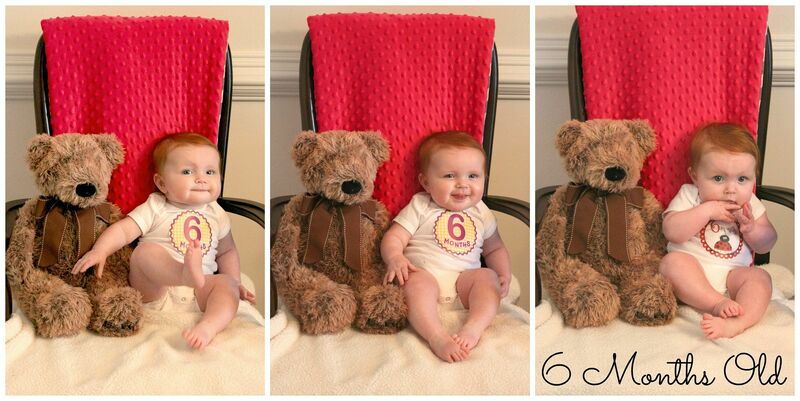 Clothing: Baby K is in 6 month clothes and slowly moving into 6-9 month clothing. I recently put all of her 3 month clothes away and cannot believe how many items she has worn; I had a ton of clothes to store. I'm sad that there are some cute outfits that she won't wear again because they are too small. I'm saving a lot of stuff in case our next child is a girl. Miscellaneous: Over Christmas, Baby K started developing a little stranger anxiety. She would cry anytime someone besides Tolar and myself held her. Or my brother in law. We called him the baby whisperer because he was the only person she would go to and not cry. It took her almost the entire week before she was comfortable having someone else hold her. I think some of our sad emotions from losing my Mimi and JoJo also affected her. Its amazing what babies can pick up on! We also switched her car seat. She is no longer in the baby carrier, but is now in a convertible car seat. We had to buy her a new car seat anyways because of the car accident we were in earlier this week (anytime a seat is in a accident, you need to replace it since you don't know if its been damaged). So we figured it was the perfect time to switch things up. She looks so small in her new seat, but really seems to like it. Our girl gets really happy whenever she sees Tolar or I. This makes us feel so great, we love that she is comforted anytime she is with us. Something that was so fun over Christmas was seeing Baby K unwrap her gifts. We would start to rip the paper and get her to hold onto the wrapping paper and she would pull it a little. Can't wait until next year when she can really help unwrap them! Such a cutie! They grow faster than you think, all the best for 2014! My daughter turned 7 months today and I feel the same! It's like overnight she went from being a baby to a toddler. She started trying to clap this week, is almost crawling and wears some 12mo clothing. sigh. I think I will be ready for baby #2 before Daddy! Quinn is just like your daughter; she NEVER sits still. She has been like that since pregnancy. Won't it be so fun to compare their gift opening skills from this year to next year? !